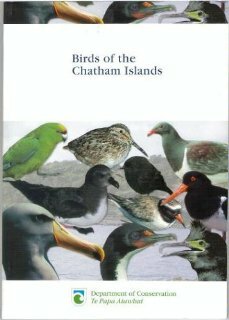 Written by Hilary Aikman & Colin Miskelly, Birds of the Chatham Islands was published by the Department of Conservation in 2004. It includes information and images for all 68 bird species that breed on the Chatham Islands, plus four migratory wader species that are regularly present. In addition to the extracts reproduced on New Zealand Birds Online, there are 24 pages of introductory text, covering topics including the relationship between Moriori and Maori and the birds of the Chatham Islands, the history of bird research and conservation on the Chatham Islands (including brief biographies of Sir Charles Fleming, Don Merton, David Crockett, Manuel & Evelyn Tuanui, and Bruce & Liz Tuanui), and information on sites to visit. The 18 pages of appendices include a checklist of 181 bird species and subspecies recorded from the Chatham Islands. Birds of the Chatham Islands can be purchased from Department of Conservation's Wellington Visitor Centre, 18 Manners Street, Wellington. Alternatively, Birds of the Chatham Islands, along with other Department of Conservation science and technical publications, is available electronically on the Department of Conservation website.